Gastrointestinal diseases are common in children. The clinical diagnosis is often challenging due to significant overlap of signs and symptoms among different conditions. Radiological studies are useful in detecting pathological conditions due to congenital or acquired structural malformations in organs. Pathological conditions in the gastrointestinal tract, however, often result from organ dysfunction (e.g., motility disorders) without significant morphological changes. These conditions are best evaluated with scintigraphic techniques. Nuclear medicine studies of the GI tract are sensitive, noninvasive, and physiologic techniques that can show functional pathologies in different parts of the GI tract. They require minimum patient cooperation, are well tolerated, and entail a low radiation burden. They can also be quantified for more objective evaluation, for better intersubject comparison, and for monitoring response to therapy with serial imaging. 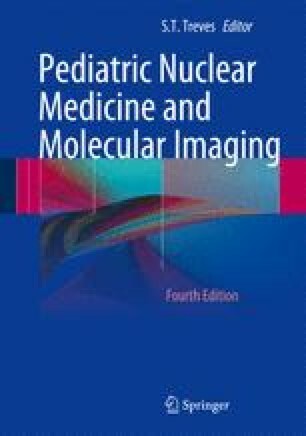 This chapter presents a detailed description of nuclear medicine studies in the evaluation of gastroesophageal reflux, gastric emptying, esophageal transit, and pulmonary aspiration in children. Reference is made to the underlying pathophysiology, clinical presentations, diagnostic evaluation, and therapy. The role of nuclear medicine studies in comparison to alternative imaging and non-imaging diagnostic techniques is emphasized.